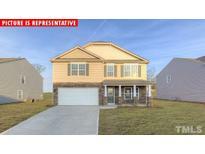 Below you can view all the homes for sale in the Edgemont Landing subdivision located in Wendell North Carolina. Listings in Edgemont Landing are updated daily from data we receive from the Raleigh multiple listing service. To learn more about any of these homes or to receive custom notifications when a new property is listed for sale in Edgemont Landing, give us a call at 919-759-5754. Home comes with RWC 10 Year Builder Warranty. MLS#2249727. 782. Agreements written on Builder's form. MLS#2249739. 782. Agreements must be written on Builder's form MLS#2249743. 782. Agreements must be written on Builder's form. MLS#2247920. 782. Agreements written on Builder's forms. MLS#2247908. 782. Agreements must be written on Builder's form. MLS#2247731. 782. Agreements must be written on Builder's form MLS#2247729. 782. Agreements must be written on Builder's form. MLS#2247746. 782. Agreements must be written on Builder's forms. MLS#2247750. 782. Agreements must be written on Builder's form. MLS#2247725. 782. Agreements must be written on Builder's form. MLS#2244309. 782. Swimming pool community with club house, 2 play areas & walking trails. MLS#2244318. 782. Pool, clubhouse, play lots for smaller kids walking trails. MLS#2244368. 782. Agreements must be written on Builder's form MLS#2244217. 782. Agreements written on Builder's forms. MLS#2241334. 782. Agreements written on Builder's forms. MLS#2241335. 782. Agreements written on Builder's forms. MLS#2241232. 782. Agreements written on Builder's forms. MLS#2239067. 782. Home comes with Move-In-Package (free Fridge, 2” Blinds and Garage Door Opener) plus RWC 10 Year Builder Warranty. MLS#2238559. 782. Home comes with Move-In-Package (free Fridge, 2” Blinds and Garage Door Opener) plus RWC 10 Year Builder Warranty MLS#2236246. 782. Agreements must be written on Builder's form. MLS#2236172. 782. Agreements must be written on Builder's form. MLS#2235023. 782. Agreements must be written on Builder's form MLS#2233230. 782. Agreements written on Builder's forms. MLS#2231558. 782. Agreements must be written on Builder's forms. MLS#2231519. 782.